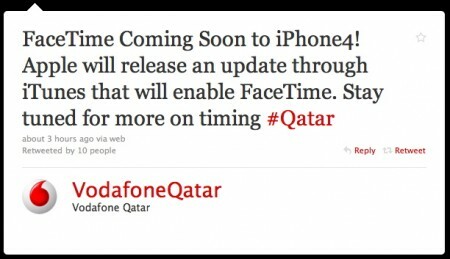 Vodafone Qatar has announced via a Twitter message that FaceTime will return to the iPhone 4. The feature will return via an update through iTunes. It did not specify whether it will be a Carrier Setting file or as part of the next iOS update. We will soon find out if this fix will be exclusive to Qatar or the Middle East. And if it was for Qatar only then what is Mobily doing it? So far we didn’t hear of any similar announcements from other carriers in the region. it’s sure will be enabled in Mobily too ! Waiting to see Apple homepage update for Facetime. Mobily can’t blame Apple now, isn’t it?!! !